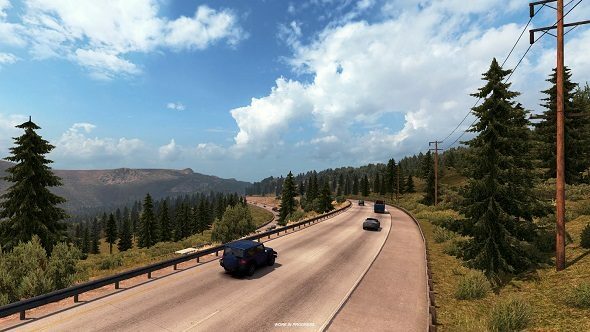 American Truck Simulator has undergone a huge transformation, adding hundreds of miles of open road, reworking cities, putting extra truckstops in and more, all in a bid to recreate the epic scale of the Unites States. The developers have celebrated the update’s release in patch 1.5 how any game developer should: with a dubstep trailer. Watch the video embedded above. It’s a different pace, but we have a good list of the best racing games on PC. The rescale changes the world scale from 1:35 to 1:20, meaning it’s now a 1.75x larger map. It’s clearly a significant undertaking, and tweaking the size of the world has also led to some other bits being changed, with longer day and night cycles, a rebalanced economy and more. Check out the rescale highlights below for a good look. 28 reworked or new junctions – most notably – Reno, San Francisco, San Diego, L.A.